What is the ERROR.TYPE Function? The ERROR.TYPE Function is categorized as an Information functionFunctionsList of the most important Excel functions for financial analysts. This cheat sheet covers 100s of functions that are critical to know as an Excel analyst. The function returns a number that corresponds to a specific error value. If there is no error, it will return #N/A. While doing financial analysisFinancial Analyst Job DescriptionSee a real Financial Analyst Job Description including all the skills, experience, and education required to be the successful candidate for the job. Perform financial forecasting, reporting, and operational metrics tracking, analyze financial data, create financial models, we can use this to test a specific error value. Also, we can use ERROR.TYPE to display a customized error message. This can be done using the IF function. The IF function can be used to test for an error value and return a text string, such as a message, instead of the error value. Error_value (required argument) – It is the error value for whom we wish to find the identifying number. Though error_val can be the actual error value, it will usually be a reference to a cell containing a formula that we want to test. 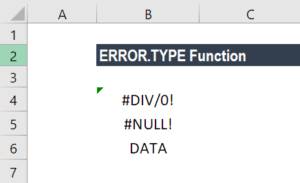 How to use the ERROR.TYPE Function in Excel? Let’s see a few examples to understand how the ERROR.TYPE function works. Now we wish to input a customized message. What we want is that this formula should check the given cell reference, i.e. cell A2, to see whether the cell contains either the #NULL! error value or the #DIV/0! error value. If errors are found, the number for the error value is used in the CHOOSE worksheet function to display one of two messages; otherwise, the #N/A error value is returned.